It is with great honor to extend this sponsorship invitation to you for the upcoming Annual Notre Dame Schools Annual Golf Scramble to be held on Sunday, August 2, at Twin Ponds Golf and Country Club. Please take a moment to review the enclosed information on the different levels of sponsorship. 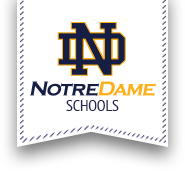 Notre Dame Schools is a private Catholic School System grades Pre-K-12 in Utica, NY. Notre Dame Schools is dedicated to providing a Catholic co-educational program in a value-centered, nurturing environment where academic excellence is fostered. Personal attention encourages all students to discover and develop their unique gifts and talents so they can reach their God-given potential. We challenge our students to identify and use their gifts in service to others. Notre Dame has been providing the highest quality Catholic education for over 50 years. This year’s tournament promises to be a superb event. Participants will enjoy a great day of golf while networking with other players and sponsors who support our school. We pray that you consider becoming a Sponsor this year. For more information, please contact Ms. Kari Puleo at 315-724-5118 ext. 35 or via e-mail kpuleo@syrdiocese.org. We greatly appreciate your consideration and look forward to hearing from you soon!